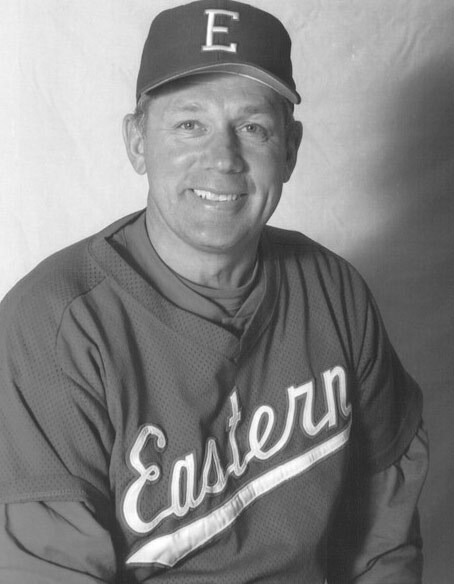 Bill Holowaty is a member of the UConn Basketball All Century Ballot and currently the head baseball coach at Eastern Connecticut State University. He’s earned the honor of baseball coach with the most wins in New England for a Division III team. He’s won four National Championships and was inducted into the Baseball Hall of Fame in 2002 for coaching a team that has won over 1000 games. He grew up in upstate New York in a small town called Mohawk where his high school graduating class was a mere 70 students. 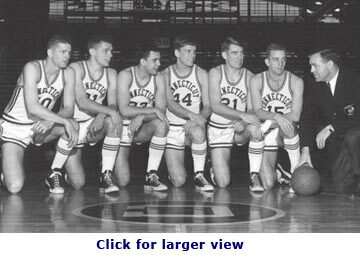 An assistant basketball coach at Duke University by the name of Fred Shabel began recruiting Bill during his sophomore and junior years of high school. North Carolina, Wake Forest and about 20 other schools were interested in him. Bill was also offered baseball and football scholarships but wanted to be a National Basketball Association player and then a basketball coach so he chose the basketball scholarship. He visited North Carolina, (he was the first kid Dean Smith - head coach at NC - recruited out of New York), Wake Forest and Duke one weekend during his senior year of high school. On his way home he stopped off at Villanova, another school interested in him, but for football. After talking to the football coach, he asked to speak to the basketball coach. The football coach asked if he was there for football or basketball, after which Bill thought briefly and knew he didn’t want to play football. When he returned home, he received a call from Coach Fred Shabel, who was a recent hire as head coach at UConn. “I have a new job at UConn, do you want to go to UConn?” Shabel asked. “I said no, I don’t want to go to Alaska,” Bill said during our interview, referring to the Yukon Peninsula in Alaska. “I had no idea where UConn was. You never heard of UConn back then”, Bill told me. “I visited UConn, I liked Coach Shabel, and I wanted to make my future home in New England so I signed with UConn”. After signing with the Huskies, UMass started heavily recruiting him. Even though Bill found the Massachusetts school’s basketball coach sitting on his front porch when he got home from school one day, he didn’t falter. His mind was already made up to go to UConn. Although his high school was small, Bill used to play in a summer basketball camp with all sorts of great basketball players, including professionals, and Bill did pretty well against them. He thought he was the best thing since sliced bread. “You think you’re better than you really are” he said. When he got to UConn he was really aggressive and hard working and they thought he was super. He looks back now and says, “Was I good enough? No, but I would never have done anything differently”. He earned the honor of being a member of the best freshman basketball UConn team, but proceeded to flunk off the team. Back then as a freshman, you could not play on the Varsity team until you were a sophomore. As a sophomore “I was supposed to be the sophomore to watch, one of the top basketball players in the country”. He was named to the starting line up. His team scrimmaged Providence (Jimmy Walker’s team), when Bill went up for a rebound he came down on Toby Kimball’s ankle and turned his own ankle, causing an injury that kept him from playing most of the year. He came back to playing but didn’t do very well but finally when he was a senior he played regularly and felt he was an acceptable basketball player. “I always wanted to be a big time basketball coach” Bill said, so he stayed at UConn after graduation and was named the assistant basketball coach. Coach Shabel left UConn to be an Athletic Director at University of Pennsylvania. Burr Carlson became the basketball coach at UConn and Bill became a graduate assistant at UConn. He got his master’s degree, worked at Mansfield Training School, was a resident advisor of the dorm and played in a semi-pro basketball league. Then he got a call from Eastern Connecticut State University, a Division III university, asking him if he wanted to be the assistant basketball coach and take on baseball too. “I said no, I don’t want it, I want to go on to be a big-time basketball coach”. He talked to Coach Carlson about it and Coach Carlson suggested he take it for a year or two to get his feet wet. Bill went to Eastern, 36 years ago, and has been there ever since. At Eastern, Bill was the assistant basketball coach for six years. He then became the Athletic Director for 15 years and then retired from being the AD and is currently the head baseball coach and a full professor of Education. He’s in his 36th year of coaching baseball. This summer his team went to Holland and played in a world tournament. He said that Eastern has a great baseball stadium, and called it the nicest facility in the state. “At Eastern our kids graduate and have a positive life afterwards. It’s ‘big time’ in our minds. Some kids sign contracts and some don’t but they have a healthy, positive career and I’m a very big believer in that”. When recruiting kids he tells them he’d love to have them come to Eastern but he wants them there for the right reasons, to be a good quality student athlete. When asked about his most memorable moments at UConn Bill said, “I’ve been so blessed with so many nice moments. It all goes by so fast”. His four years at UConn were like a blink of the eye. As a student his most memorable moment was meeting his wife. He was a freshman, watching a Varsity game against Duke, when he met her. 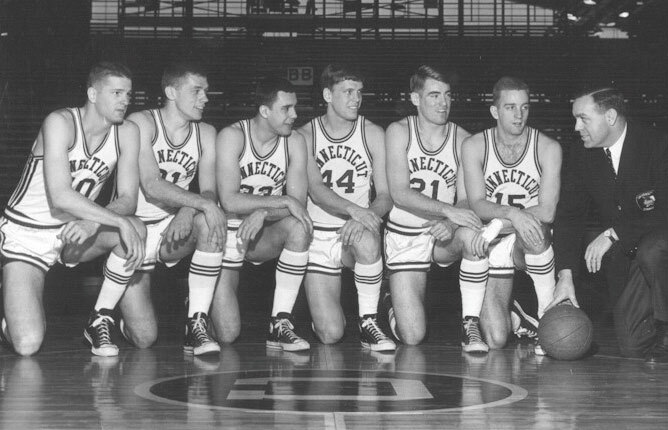 (They had played Princeton the night before and Dom Perno stole the ball and made a basket over Bill Bradley.) As an athlete, his most memorable moment was in his junior year going back to New York, playing at Syracuse, when he was the high scorer of the game. He said he met a lot of people at UConn and still has a lot of friends from UConn. Bill is obviously a sports guy so he still follows UConn basketball, football, and baseball. He thinks Coach Calhoun is a heck of a coach who does a tremendous job coaching. He said that Coach Calhoun took a school from the sticks and made it something big, bringing the kids from the city to the country. Each year that his team has won a National Championship they lost heart breakers the year before. The defeats really go deep when you have a good group of kids, he reasoned. It will drive them to a different level so when UConn lost the game against Texas last year and they could have won it, they’ll be even better this year. However, many factors are involved to get there. The kids all have to be on the same page and it’s tough to do, to preach and have your kids believe it, but Coach Calhoun has done it and done a very good job at it. Bill lives in Columbia, CT, five minutes from his job at Eastern with his wife Janice, also a UConn graduate. She has a daycare business at their home. Bill told me that when he proposed to his wife, he told her that sports come first and she said, that’s fine, as long as you take me with you. They have three children: Jason, who graduated from Brown University and Columbia University and now works for Major League Baseball – Baseball Development in Europe and Africa and lives in London. Jennifer, an Eastern and UMass graduate, is an Athletic Academic Counselor at Wilbur Cross High School and Jared an Eastern graduate is a baseball graduate assistant at a college in New Jersey working towards his master’s degree. Bill said that loyalty is very important to him. He gets calls every day from kids that want to play baseball at Eastern, and he says time is the test. He was proud to tell me that he has 25 sets of brothers that have played for him and that his former ball players are now parents and they are calling him to have their kids play for Eastern. To him, that’s more important than winning a game. Bill says he has the best job in the world. When it becomes work he’ll consider retiring but to him, he hasn’t worked in 36 years.